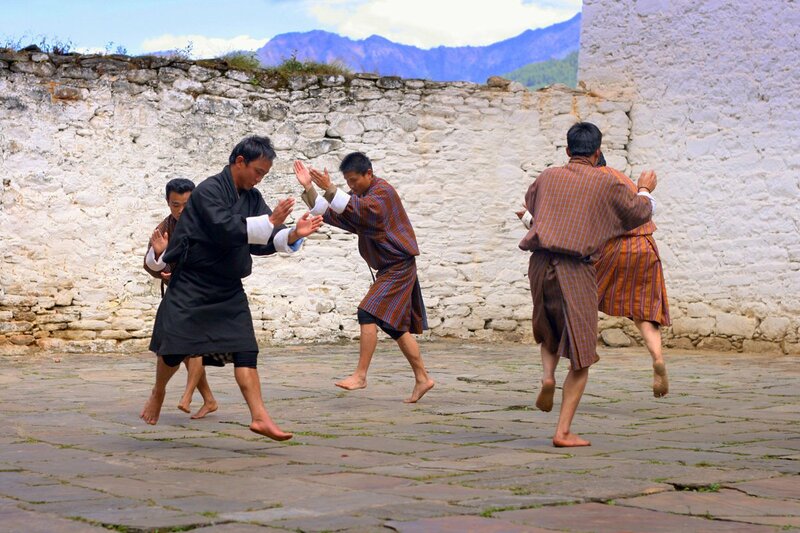 Long isolated from the rest of the world, the Himalayan nation of Bhutan still maintains an aura of mystery. Bicycling in Bhutan rewards you with stunning views and pristine nature on good paved roads with little traffic. We start cycling from Thimpu after visiting Paro and head east to Punakha, stopping to visit dzongs (fortresses), monasteries, and temples, while absorbing the Buddhist culture. 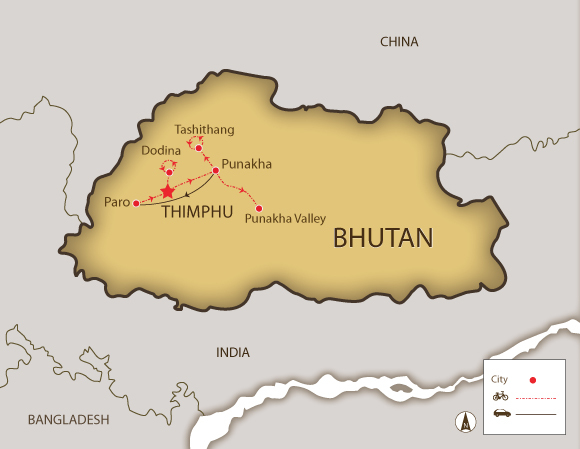 This introductory tour to the Land of the Thunder Dragon starts with a tour of Paro and a ride around the capital Thimpu. The most challenging leg is a climb to the top of Dochula Pass, down from which you’ll wonder at the scenery changes as you enter Punakha Valley. After a day exploring the lush flora and fauna around Tashithang, Punakha Dzong will amaze you with its construction. Ending with a special visit to the fabled Tiger's Nest Monastery, you will go home enlightened by the fascinating landscapes, peoples, and cultures of Bhutan. The headiness won’t be from exertion at high altitude, it will be from the once in a lifetime experience! Arrive in Paro with an airport pick-up and visit the Paro Museum and one of the major Dzongs (fortresses). After a morning transfer to Thimphu, we ride in the afternoon to Dodina and visit two monasteries set back high amongst the mountains. Today will be a major hill challenge to the pass at Dochula, which is known for its spiritual energy and 108 Chortens that are atop the pass. After lunch, we descend down the pass through pristine forest. This is an enjoyable ride out and back, passing through lush forests famous for their rhododendron trees, and an area well known for its bird life and wild orchids. Explore Punakha valley, the Punakha Dzong, one of the most impressive Dzongs in Bhutan, and the temple of Chhimi Lhakhang. We leave Punakha early for a drive back to Paro and for a visit to the Tiger's Nest (Taktsang Monastery), a highlight of the tour. We transfer you to the airport for onward travel. Day 2 - Thimphu - Dodina Loop Ride 35km. +688m / -689m. Amazing trip to Bhutan with Spiceroads that facilitated with its great staff. An excellent combination of cycling, visiting sites, eating local foods, meeting local people and learning about the Bhutanese culture. I found Bhutan utterly magical and felt completely privileged to see and experience it by bike. It was a perfect way to experience the majestic Mountains, beautiful Bhutanese people & their serene spiritual culture. Touring on a bicycle is the perfect pace to take in all the sensory elements that the country has to offer, while at the same time challenging your body! This bike tour is a true classic with Himalayan mountain passes, sweeping descents, magnificent views, clean air, abundant culture and history in one of the most secluded countries in the world. We ride 190 km in 3 full and 1 half days of riding. The riding varies between some easier shorter days and one challenging hill climb to the top of a pass. The accommodations are generally 3-star hotels with traditional amenities. We have attempted to keep the tour as authentic as possible and have tried to use local small accommodation wherever possible. Regardless of the location, every day you can be assured to get a comfortable room and a good night's sleep. Biking Conditions: This tour is primarily on paved roads with very little traffic. The tour goes over one mountainous pass as well as valley flat-lands. There are a few challenging climbs as well as some fast, sweeping descents. Any portion of the ride can be skipped by utilizing our support vehicle. Suitability: Cyclists should be in relatively good overall physical shape with at least a moderate degree of cycling experience. Being physically fit will of course be a huge asset, but, as the tour is fully supported, the van is always close at hand if needed. Arrive in Paro where you will be picked up from the airport. We check into the hotel, and, in the afternoon, we’ll visit Paro Museum, which features local art, textiles, artifacts, and sculptures. We’ll also visit one of the major Dzongs located in Paro. In the evening, we’ll have a welcome dinner prepared in traditional Bhutanese style. There is a short morning transfer to Thimphu (approx 2 hrs), and then the rest of the morning will be spent visiting museums and the National Institute for Zorig Chusum (an arts and crafts school). In the afternoon, we ride to Dodina past small villages, farmlands, and dense forests. The end of the road in Dodina features two monasteries set back high amongst the mountains. The return is a gradual downhill to Thimphu. Later in the evening, you can explore the town well known for its handicraft shops. Today will be a major hill challenge, as we have a 5 km warm up before we start climbing for the next 18 km to the pass at Dochula, which is known for its spiritual energy and 108 Chortens that are atop the pass. Lunch at Dochula Café is the perfect place to take in the expansive views of the deep valleys and eastern Himalayas. After lunch, as we descend down the pass, we move from oak, maple, and blue pine forests into rhododendron, hemlock, and fir vegetation, and along with many monasteries that come into view to make this a downhill ride to remember. Today is an enjoyable out and back ride with the outward leg being a gradual climb to Tashithang. We pass through lush forests famous for their rhododendron trees, which, if they are in bloom, make for magnificent views. This area is also well known for its bird life and wild orchids. The ride is more leisurely as we take time to explore the beautiful and lush valley that surrounds Punakha. We will visit Punakha Dzong, one of the most impressive Dzongs in Bhutan which was built in 1638 and is all the more remarkable as it was constructed without the use of drawings or a single nail! The other major visit today will be to Chimi Lhakhang. Built in 1499, it is also known as the temple of the “Devine Madman” (Lama Drukpa Kunley) and of the disciple of one of the five great tertons (treasure discoverer), Pema Lingpa. This temple is also noted for its blessing of women who wish to bear children. We leave Punakha early for the drive back to Paro. It will take about 4-6 hours depending on road construction, but we will ensure that there's time to visit the Tiger's Nest (Taktsang Monastery), a highlight of the tour. Perched on a cliff, it's a hike to reach and, before reaching it, one must cross a bridge that fords a large waterfall that drops 60 m (200 ft) into a sacred pool, not easy for those with a fear of heights. First built in 1692, this monastery is scared to Buddhists all over of the world. The tour concludes as we transfer you to the airport for your travels onward. Bikes are included for this tour and are well-known makes of hybrid or mountain bikes (depending on the tour) with lightweight alloy frames, 24- to 27-speed gearing, v-brakes, and Shimano components and front suspension. Contrary to just about the rest of the world, Bhutan does not issue visas before you arrive through their embassies or consulates. The only way to get a visa is on arrival to the country, however, you must submit an application form through a tour operator for approval before arriving. SpiceRoads will submit your application for approval. This takes a minimum of 1 week. Please contact us for more information. We recommend that you visit a travel medical doctor and ask about the following vaccinations: typhoid, polio, tetanus and hepatitis A. As there are some high altitude passes you may consider bringing Diamox – but please consult a physician first. An umbrella, or light rain gear, should never be too far when traveling in Bhutan. During any month of the year it could, and will, rain. There are two optimal times of the year to travel in Bhutan. The months of March/April offers a period of warmer temperatures and bright skies. During August/-October is even more popular because of the cooler temperature and cloudless and crisp skies. Bhutan has a fairly mild climate year-round. Meals are included as per the itinerary where B = breakfast, L = lunch, D = dinner. Meals are a mixture of Bhutanese and western cuisine, with the local food being mainly rice with vegetables with chili being used as a vegetable, not a flavoring – so beware! Local cheese is also popular and also quite tasty. Lunch will tend to vary between a packed lunch and some hot meals when local restaurants are available. Any special dietary requirements can also be catered for as well. Please let us know at the time of booking. The Bhutanese currency is the ngultrum and is pegged to the Indian rupee. As the rupee and ngultrum are traded at par, rupees are generally accepted in Bhutan and may be occasionally given as change. Bhutan is a cash economy. Don’t count on using your Visa and Mastercard, but there is an America Express office in the capital, and Amex is accepted in a few rare instances. Your best option is to change dollars or euros into ngultrums at the airport as the exchange rate is the same as in the banks in town. You can also change your money at the hotels in Thimphu, but the rate is not as good. You'll mainly need money for handicraft souvenirs and drinks as everything else is included in the tour.